Last edited by jserraglio on Sat Mar 03, 2018 7:27 am, edited 2 times in total. Thanks for the alert, jserraglio! This set is available on American amazon for $254, cheaper than the European price. It was originally issued in Japan for $150, according to an amazon reviewer. Wonderful music-making, but I have most of the good titles already. Szell was one of the greats. Thanks, it looks like another confusing battle of the megaboxes! The Amazon sale item is not the 106-disc Complete Columbia Albums set Sony just announced for August 2018. That $254 Amazon item is entitled George Szell: The Edition, was issued around 2013 only in Asia (S. Korea, IIRC) and weighs in at less than half the size of the new one (49 discs total). There is also the matter of whether or not buyers will be treated to new re-masterings in the upcoming set. These aren't just the "Columbia albums" - the listing also includes Szell's recordings published on the Epic label. For me, his first recording of Dvorak's Slavonic Dances is the best; published on 3 LP sides, with the Smetana quartet #1 as filler, it featured some less hurried tempos and, I think I remember, some repeats not in the stereo remake. These aren't just the "Columbia albums" - the listing also includes Szell's recordings published on the Epic label. I think for their preliminary title Sony was using the term Columbia loosely. CBS/Columbia issued recordings on the Columbia, Okeh, Epic and other labels. It certainly would be more accurate to call this set George Szell: The Complete Columbia and Epic Album Collection, and I bet Sony does so by the time it appears, as they did for their Charles Rosen box. It's actually better that the Epic recordings are included, even if they weren't originally published as "Columbia albums." AhA! (Shakes head trying to clear away cobwebs). JohnF: I love Szell's Dvorak, either the late symphonies or the Slavonic Dances! Back when I was 11 or so, Szell and the Clevelanders came to Lancaster as a Community Concerts attraction and their program included four of the Slavonic Dances. First time I heard that music or anything like it, and later when I could afford it, Szell's recording was the obvious choice. Later I picked up the Vaclav Talich/Czech Phil version, the postwar Supraphon recording then published in the US on Urania, and if anything I like it even better. Fortunately I can have both! Absolutely. The Epics, as you point out elsewhere in this thread, are some of Szell's best and most iconic recordings. 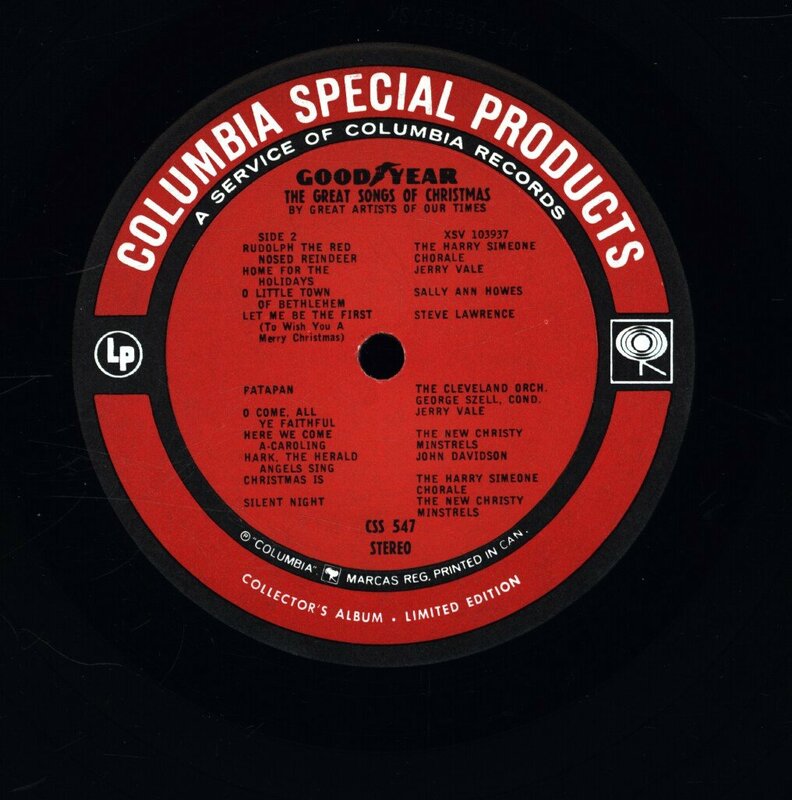 One reason they appeared under that imprint was that the likes of Ormandy, Walter and Bernstein were dominant on CBS's flagship Columbia label. 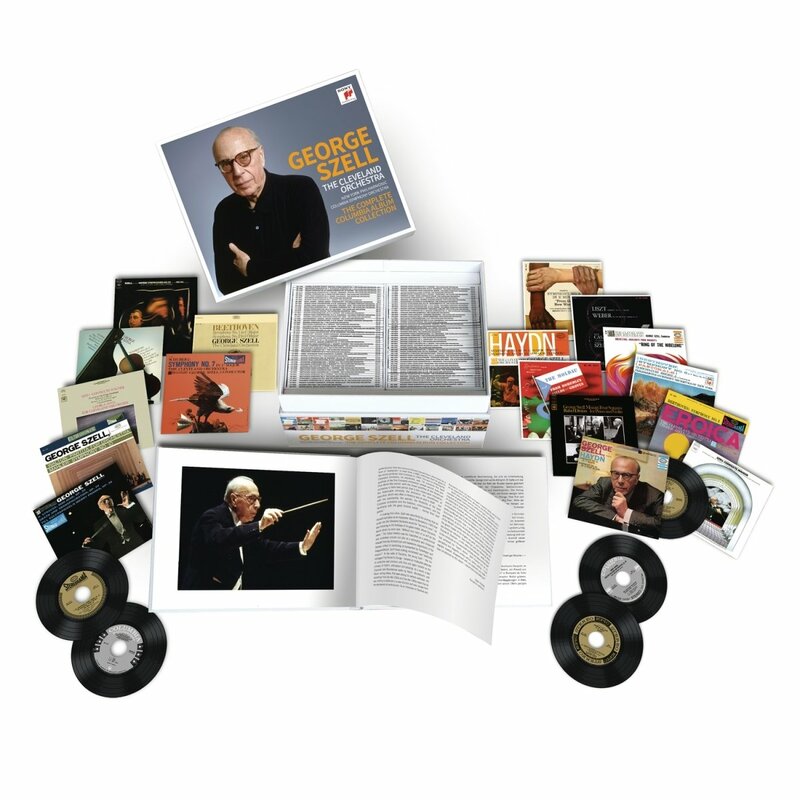 I noticed that Sony's Leon Fleisher box also contains Fleisher's (and thus some of Szell's) Epic recordings. Hopefully, Sony will do right by this great artist and use the latest technology to remaster the recordings that have not recently been redone. As the bad pun goes, Szell sells. RMCR wrote: If it's like the Reiner & Munch Boxes, it [the new Szell box] probably used the best remasters available including XRCD and others. Anything not previously issued probably will be remastered. If they used the Japanese remasters it should sound better than the Essentials. SONY really ticks me off. I have most of these recordings already, as I am a confirmed Szellot. Some of them I have in multiple versions. But they always fail to reissue a few of them, so that when they finally come out with the Big Complete Box, they have sold you the same recordings three or four times in different formats, and you have to get yet another one to make sure you have absolutely everything. I am rebelling against this. I am going to stick with what I have, and I'm not going for this. SONY really ticks me off. I have most of these recordings already, as I am a confirmed Szellot. I am rebelling against this. I am going to stick with what I have, and I'm not going for this. As a confirmed Szellot myself, I intend to wait till this set clocks in at about a buck a disc, as did the splendid Perahia set (75¢). Meantime, I will enjoy my Szell LPs. Of course record companies reissue the same product over and over in various configurations. That's what they've done for more than a century now. Buyer beware. I, too, am very interested in Szell and already have much on both LP and CD. This 106 CD set seems to be pricey at 250 Euros (through JPC). That's what, about $312 USD or so. The set isn't even listed on Amazon USA nor England as yet (last time I looked) [amended: I see it is now on Amazon/USA as indicated], nor MDT in England. Shipping that set will also add to the cost substantially. I show 102 CDs with Szell's name on them, but many duplicates among them. Still, this would be quite a set to own. Hard to believe the Perahia set is down to 75c per CD. Maybe all that has something to do with him switching his allegiance to DGG. I, too, am very interested in Szell and already have much on both LP and CD. This 106 CD set seems to be pricey at 250 Euros (through JPC). That's what, about $312 USD or so. The set isn't even listed on Amazon USA nor England as yet (last time I looked), nor MDT. Shipping that set will also add to the cost substantially. I show 102 CDs with Szell's name on them, but many duplicates among them. Still, this would be quite a set to own. Last time I checked amazon had one copy for $399 of the Sony Perahia set.....boy am I glad I got mine when it was cheaper! I paid 55 bucks/73 discs. My Perahia set was no charge. It was a gift. I've got you all beat!!! This title will be released on August 10, 2018. Like others have expressed hereon, SONY had a chance to issue a "complete Edition," and apparently the new edition does not afford us ALL of Szell's Epic and Columbia recordings. This set seems a bit overpriced in comparison to other "editions" that are complete by other classical musicians. If it was ALL embracing, it would have much more appeal for me. I will pass on this incomplete "edition." After all, I think this is what collectors really want. Hi all, this is the thread that got me to register, and this my first post. It's in reference to Lance's point about the Szell box not being absolutely complete. Off hand Lance, do you have an idea of what exactly might be missing? You mentioned possibly some of the Epic releases. I'm going to spring for this baby anyway, as I have a feeling there will be some remastered issues - which are long overdue. Thanks, and glad to be a part of the group! Please let me the first to welcome you to CMG! We're glad to have you aboard. I, too, will be springing for Szell's complete box when it appears. Aside from his Prokofiev V(Bernstein's was much better), Szell was one of the most consistently excellent conductors of his generation. 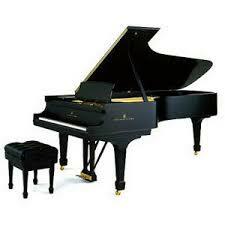 Fr'instance, I love the sound world of his Beethoven, intimate without losing power. His conception of Wagner and Bruckner was superb as well. My father, a conductor, admired Szell above all rivals. He would often point out to me on records some particularly neat piece of work, some brilliant resolution of a conducting problem, some tricky timing or internal voices brilliantly realised. Alas, I no longer recall any to cite them to you. in addition . . . I've heard this performance on Operashare and it's wonderful. Now it has been released by Immortal Performances, pricey label, but noted for its fine remasterings of Toscanini and Furtwangler material. That looks fantastic. Thanks for alerting us to it. I will have to ponder deeply, especially in view of Lance's thread about how much we can listen to (I already have 13 complete performances). Still, what a cast! and the conductor. Have you heard it? How thin is the sound? It seems as though I recall someone asking (was it Rach3?) what was actually MISSING from the forthcoming SZELL set. Has anyone done any looking to see what is missing that SHOULD be there that has access to a complete listing of what IS available on this set as opposed to what is NOT? Sony must have left out some major items (mono or stereo) along the way. I will watch this thread. Some of you are ALMOST convincing me that this is worth acquiring. But as mentioned, I already have a huge number of his work on CDs (and lots of LPs, as well). I have only heard what was made available on Operashare from an off-air broadcast (the same one used in this issue). The sound there was limited but decent for its vintage. Still, this arresting performance came thru loud and clear in spite of the dated sound. I was taken aback by Szell's conducting: tense, energetic, almost driven (in 1944 he was only in his late forties and not yet the MD of the Cleveland Orchestra). I had never heard him conduct a complete Wagner opera before. Wow! After I heard this, I recall thinking what a great Wagnerian Szell was, and what a loss for us all that a decade later he got BINGED by the Met's hack-in-chief. George Szell’s Walküre is at the opposite end of the spectrum from what you would hear from Furtwängler, Walter, or even the fairly quick Böhm. What Szell provides, in addition to fast tempos, is an incisiveness of attack that adds a tough rhythmic spine to Wagner’s music. In addition, Szell clearly has a deeply embedded sense of theater and is alive to the text and drama at all points. We hear it in the very opening storm music, and we hear it throughout. The orchestra interacts with every character, and even adapts the psyches of those characters. The word that springs to mind when hearing this performance is ensemble. It is a performance in which every singer and every orchestral musician is interacting with a similar mindset, and that mindset is firmly established on the podium. Of all the Melchior performances of this role that have been preserved (and I have seven), the tenor is at his most heroic, even bellicose, here. The whole performance is marked, vocally and orchestrally, by crisp rhythms, sharp orchestral attacks, and drama at white heat. The opening of act II conveys the frenzy of the wild ride of the Valkyries with a sharp rhythmic snap and prominent timpani. When things do relax (“Winterstürme” for example) it is all the more effective. Melchior is a miracle. This performance took place after he had been singing Wagner’s heaviest roles for two decades, and when he was 54 years old. But the tone remains firm and centered, the top rings brilliantly, and he never phones in a single phrase. He ranges widely between tenderness and intimacy to bold and heroic, even fierce. Melchior defined for the second quarter of the 20th century what a Heldentenor was supposed to sound like, and we haven’t heard his like since. The heroic brilliance he brings to the end of the first act is irreplaceable. What is somewhat astonishing about this performance is that the two female leads, great as they are, represented the second level of Wagner singing in their time. These were the ladies who performed when you couldn’t get Kirsten Flagstad, Lotte Lehmann, and Marjorie Lawrence to sing! One would happily encounter this pair in any performance of Die Walküre today and feel fully gratified at the experience. Bampton may not be the most feminine of Sieglindes, but her voice rings gloriously, and she is dramatically sensitive as well. The upper-middle part of her range shines brilliantly while never thinning out. The richness of color it retains gives her portrayal a warmth and femininity that balances the power of her singing. As for Traubel, the beauty of her voice is a well-known commodity. She equalized brilliance and richness of tone more evenly than almost any dramatic soprano. Her one weakness was an unreliable top, sometimes sounding forced. This problem appears hardly at all in this performance, and it didn’t stand in the way of a major career at the Metropolitan. Although she preferred the role of Sieglinde, Traubel sang Brünnhilde about 40 times with the company, and this performance documents the strengths of her interpretation. Unfortunate cuts in the score, surprisingly permitted by Szell, deprive us of important parts of her role (and Wotan’s), but there is much here to admire. One’s attention is first drawn to the sheer glamour of the sound; even in the opening battle cry she sings the music more than shrieking it, as often seems the case. In her big scenes with Wotan, Traubel enters the drama fully, inflecting with meaning. In her final scene before her punishment is imposed, she almost breaks our hearts with the sincerity of her pleading her case. Herbert Janssen’s voice lacked the heft of most Wotans, a point noted in Dewey Faulkner’s superb essay about this performance included in the accompanying booklet. And of course one cannot help but compare Janssen to the standard Wotan of that era, Friedrich Schorr. What is impressive is that except for depth of tone, Janssen comes off well in that comparison. Until his great farewell scene, Wotan runs the risk of boring us with his long stretches of music that verge on being conversational. Even with the unfortunate cuts in this performance, these narratives can seem directionless. Between Szell and Janssen, however, every bar has meaning and direction, and leads inevitably to the next. Faulkner points out a passage in Wotan’s scene with Fricka, beginning “Not tut ein Held,” as an example of perfect expression, and he is right. What seems so evident here is that Janssen and Szell are working together, in concert with each other, creating a dramatic and musical momentum that is quite extraordinary. His softened tone as he closes Brünnhilde’s eyes is heartbreakingly touching, and then hear the deeply touching string playing in the orchestral interlude after that moment. This is Wagner at his most poignant, and Szell captures it perfectly. If there has ever been a greater Hunding than Alexander Kipnis, I haven’t encountered him. The dark depth of tone of which he is capable, combined with the extraordinary insight of a great Lieder singer, he creates a character of pure evil but one who never spills into caricature. His specificity of inflection of every phrase make the character a real person. Kerstin Thorborg’s rich contralto voice, long experience as a Wagnerian singer, and intelligent musicality add up to a sixth wonderful characterization (as Fricka) in this cast. Like the other two leading ladies, Thorborg’s tone has an inner glow at its core that defines an operatic ideal. The Valkyries include the likes of Thelma Votipka, Martha Lipton, Hertha Glaz, and Margaret Harshaw, surely as starry a group as one would ever be likely to find. They too perform as a true ensemble, blending and interacting with each other and the orchestra. And so it is that we get back to where we started in this review: George Szell and the Met Orchestra. I remember the first time I heard the Cleveland Orchestra under George Szell in concert. I was stunned. Here was a small chamber group writ large. The final piece on the concert was the Second Suite from Ravel’s Daphnis et Chloë, and when four trumpets played in unison sounding like one very large trumpet I was convinced I was hearing musical greatness at a level not experienced before. It is this sense of musical interplay, whether between sections of the orchestra or between stage and orchestra, that distinguishes this performance. The orchestra is not “supporting” the drama nor “commenting” on the drama, but rather it is an integral part of the drama—another character, if you will. This is manifested by careful attention to phrasing, inflection, and dynamic shadings. While Szell is often accused of “coldness,” nothing could be further from the truth here. He brings an almost unbearable humanity, warmth, and heartbreak to the final scene between Wotan and Brünnhilde, to Wotan’s farewell, to the Todesverkündigung. It is a quite unique balance between precision and clarity on the one hand, and dramatic intensity and humanity on the other, that makes this unique among recorded performances Die Walküre. The only criticism one can rightly make is his agreement to make the cuts he did. One might ask why Richard Caniell, the proprietor of Immortal Performances, would bother with this broadcast, since the Met had issued it on a fundraising series of high-priced releases. The answer is that Caniell has improved significantly on the Met’s edition (and on Myto’s apparent copy of the Met’s work). The voices are notably richer here, and there is more color and richness to the orchestral sound. The original is still on the hard-toned side (Caniell himself uses the word “coarse” to describe the original sound), but he has given it a life that it has never before had. Also included, to bring us all back to our youth and the experience of sitting at the radio on Saturday afternoons, is Milton Cross’s commentary (separately tracked for those who wish to bypass it). Add to that the usual level of informative and insightful notes and beautiful historic photos in the accompanying booklet, and you have a release of great importance. George Szell might not be the first conductor one associates with Walküre, but his account is gripping. As one might guess from a conductor who idolized Toscanini, speeds are swift. The power of the act I Prelude is properly visceral, the climactic timpani rolls (more like rapid-fire bullets here in truth, or perhaps a deep-pitched side drum) remarkable. Urgency is immediately established; one feels that the little contribution from a wind machine towards the end of the Prelude (2:24, just before Siegmund enters) is perhaps unnecessary. The febrile strings, taut with tension, that underpin the exchanges between Sieglinde and Siegmund are remarkable in their contained tension; one hears them with preternatural clarity in this Immortal Performances issue. Detail throughout is astonishing, whether strings (even punctuating chords are clearly carefully balanced) or the lines of the Met’s creamy brass section. Surface noise is kept to a minimum, and this combined with Szell’s ear for detail enables one to hear the score with maximal clarity. His speeds are rapid (Melchior occasionally struggles to keep up), yet he can find stunning and surprising moments of stasis (“Nun weisst du, fragende Frau”), and there are concessions to tradition: Melchior’s cries of “Wälse” have massive fermatas over each repetition. Perhaps Szell rushes headlong through “Siegmund bin ich” too much, and Melchior is late on “Fern von mir”; a small price to pay for the energy generated at this point. Yet Szell’s preparation for the entry of the Wälsung twins in act II is exemplary, as is the woodwind detail after Melchior’s act II “So grusse mir Wotan.” The Walkürenritt is notable for the energy and also the presence and accuracy of the woodwind trills. As Sieglinde, Rose Bampton sounds remarkably, and appropriately, impressive. Her lyricism in “Der Männer Sippe” is simply wonderful; the way she can taper a note underlines the emotive heart of this passage. The moment she names Siegmund is well done. Bampton and Melchior are well matched, their exchanges rising in intensity. In the final act, Bampton rises to the challenge of her big, orchestra-riding phrases. Alexander Kipnis’s Hunding is noble at first; he moves to the occasional barking in anger. Clearly combative, even petulant at times, this is not a Hunding of imperious vocal depth, but rather a very human alternative. Kipnis uses the gamut of his vocal resources in this intense portrayal. The second act finds Szell fabulous at setting the stormy, intense atmosphere at the outset. Traubel and Janssen are the Brünnhilde and Wotan. Traubel is incredibly strong, her voice as well as her character shot through with steel. Her Todesverkündigung (“Siegmund, sieh’ auf mich”) is remarkable; she manages the more interior parts of the role, too, as in “Hier bin ich, Vater” from act III, laden with meaning. Kerstin Thorborg is a wonderful Fricka. What stands out about Janssen’s contributions is that there is a rare sense of narration, and while “Götternot” is involving, it certainly is not of the gravitas-laden Hotter kind. He misses the magic of the quieter second statement of “Das Ende” in his exchanges with Brünnhilde. Szell judges earlier stages of the final act well, aided and abetted by a properly fearsome bunch of Valkyries, although as the act progresses one is aware that he sometimes glosses over the profundity of some of Wagner’s harmonic progressions in his eagerness to move on. Wotan’s later speeches are really fast, and to compound matters Traubel’s “War es so schmählich” is rather bleaty; perhaps in compensation for this Janssen offers one of the more in tune renderings of “So küsst er die Gottheit von dir.” Right at the work’s close, Szell keeps the orchestra together with impeccable discipline while maintaining a sense of his characteristic tautly controlled lyricism. This performance offers a vital part of the Szell discography; there are, incidentally, lots of points of contact between the cast here and Szell’s 1942 Met Tannhäuser, heard on Immortal Performances 1053 and reviewed by myself in Fanfare 39:2. Milton Cross is the announcer, efficient as ever and a vital part of the atmosphere created (I love his description of the Valkyries as “Amazons”). The essay “Form and Fate” in the booklet is notable for its explanation of the links between the story and the original Norse tales. An important addition to the discography of Die Walküre. Although I have had this performance for awhile this was the first time I gave it a detailed listen and what a superb performance it is. Let's get the big problem out of the way and that's the cuts. A major one in Wotan's narration (very sorry for that considering Janssen but more of that later) and in the third act scene between Wotan and Brunnhilde. Considering this Szell was one of the great Wagner conductors. For him the orchestra did not just accompany - it commented, it was another singer, it illuminated. I heard things from him I have heard from no other conductor. I had no idea he was this good in Wagner and I have some other Wagner with him I will certainly hear. We all know that Janssen was a wonderful lyric baritone (still my favorite Wolfram and Kurwenal) who was pushed by the MET into the heavier Wagner roles when Schorr retired and its true sometimes there is not quite enough there. But that happens surprisingly infrequently here and his reading is the reading of a great Lieder singer. Only Hotter matches him in his delineation, his feeling, his emotional reading. It was a stunner for me and a wonderful surprise. Traubel is in magnificent voice and she responds to Janssen with a reading that I didn't think she had in her. And that lower third - stronger than either Flagstad or Nilsson is absolutely gorgeous. Melchior is Melchior - the only thing I can add is he seems to stress the valiant warrior a bit more here. Other than that THE Wagner tenor. Rose Bampton I only know from the Toscanini Fidelio and she is warm and telling - Lehmann she ain't but who is and I enjoyed her. Thorborg wipes up the floor with her Fricka - exactly the voice the role needs. All told I highly recommend this performance to my fellow Wagnerians. Has anyone done any looking to see what is missing that SHOULD be there that has access to a complete listing of what IS available on this set as opposed to what is NOT? Sony must have left out some major items (mono or stereo) along the way. * Smetana: Three Dances from "The Bartered Bride"
Hi Lance, though the initial listing omits the Smetana Bartered Bride dances, these were issued originally on Epic BC 1268 alongside Dvorak Carnival overture and Moldau - which are in the listing, so I'm pretty sure that they will be there. The Szell/Tokyo was issued long after Szell passed, so it may well not be included as it wasn't an Epic/ Columbia original release. In looking over my own discography of Szell, it is quite extensive. I have five or six Decca CDs of his work ... not sure if there were more he made with this label, but it seems Decca might offer a "short box" on his recordings with the label. EMI, however, could have a good-sized box set of all the recordings he made under their imprint and these include a number of Cleveland Orchestra recordings. RCA's John Browning boxed set has a few items conducted by Szell as well. Perhaps, given the release of Sony's big box set may compel other labels to move forward and keep the ball rolling because, as someone said above, "Szell sells." And the reason is obvious. Two more missing items from the Columbia/Epic box. Liner notes wrote: The world-renowned Cleveland Orchestra, under the direction of George Szell, is celebrating its fiftieth anniversary this year. Recording Christmas music for the first time, the Cleveland Orchestra offers a rousing version of "Deck the Hall With Boughs of Holly." Although the melody predates Christianity in England, this song ultimately became traditional with the Welsh in their celebration of Christmas. Liner notes wrote: "Patapan" is a 17th century French carol which originated in Burgundy. This is one of the many carols which tell of children marching -- singing or with musical instruments -- in celebration of Christmas. 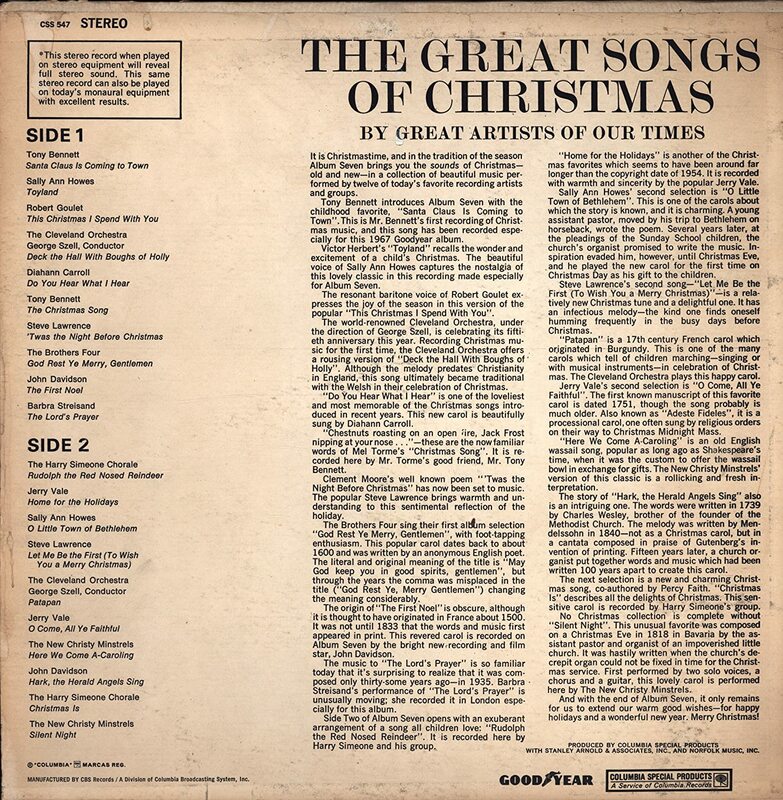 The Cleveland Orchestra plays this happy carol. Last edited by jserraglio on Sun Apr 15, 2018 3:33 pm, edited 1 time in total. 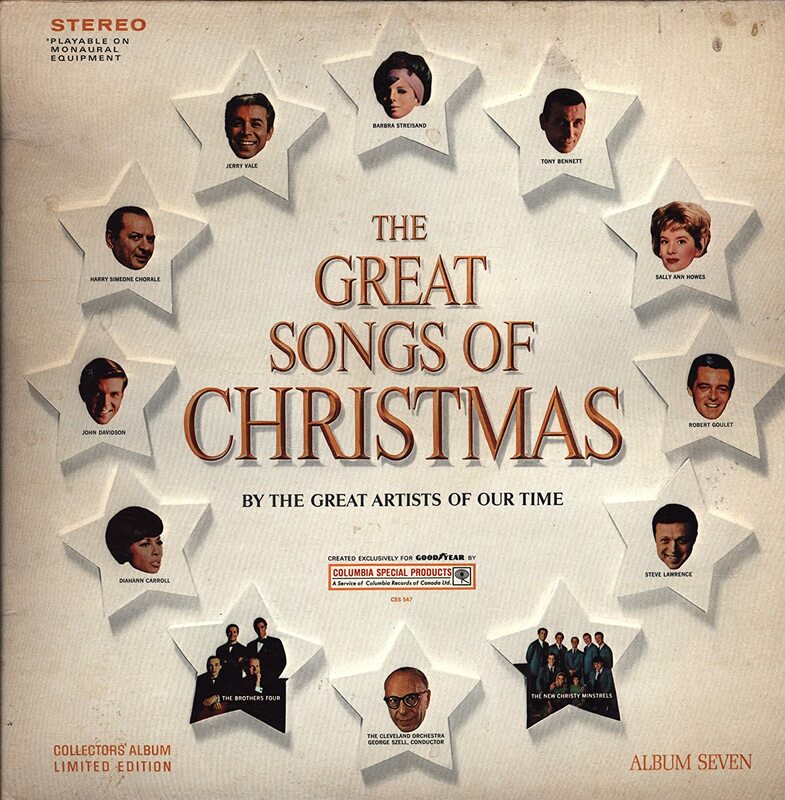 Nope, not missing, the Christmas items by Szell/Cleveland are included in the coming big box! Excellent news. As well they should be! This may be their 1st CD issue. I still have the CSP LP. I agree with T. Schurk that recordings by Szell originating on the Sony label are excluded from this collection (one has to sometimes read the titles to these collections like a lawyer). Sony issued 3 CDs of Szell in the 1990s that were licensed from the Austrian Radio (Bruckner symphonies 3 and 7 and a Mozart concert, which included Concerto No. 9, K. 271 with Rudolf Firkusny and the Symphony No. 41), none of them included here. However, this set appears to be missing Szell's recordings of two Mozart Violin Sonatas with Joseph Szigeti (K. 454 and K. 481) and which first appeared on Columbia LP. They have long been available on the Vanguard label so perhaps Vanguard owns the masters. Rafael Druian recorded four Mozart Sonatas with Szell while the box lists three (K. 376 is omitted, probably an oversight, since all four have been issued on one CD). Thank you, John. More and more will unfold, I'm sure, as it is discovered what is really missing from this mega-set. Jserraglio, thanks so much again for going to the trouble of digging out those reviews and posting them. It's clear I am going to have to lash out and buy this. Your work was not in vain! As an aside, what does "phoning in" mean, in the first review? I haven't encountered this expression, which seems odd in 40 years of following opera. Is it an American expression? Maestrob is sure to know, if you don't. "Phoning in," is indeed an American expression. It is a pejorative indicating a routine performance done by rote with no particular effort or thought put into it either as a result of following usual conventions, or knowing a work so well you can nearly do it in your sleep. CD 1 consists of two performances conducted by Szell: The Emperor Concerto (LPO), and Tchaikovsky PC 1 (New Sym Orch). CD 3 is of the Mozart PCs 23 & 27 (Wiener Phil). CD 17 has the Brahms PC 1 (LSO). The big 24 CD Graffman box has two CDs on which Szell and the Cleveland Orch. appear--the Prokofiev CD which has the PCs 1 & 3 in addition to the Piano Sonata 3, and the Tchaikovksy PC 1. CD 1--Wagner bleeding chunks: Tannhauser Overture (14'13) |Tannhauser: "Dich, teure Halle," Margaret Harshaw, soprano (3'10) |Tristan und Isolde Prelude (11'26) & Liebestod (7'05), Margaret Harshaw, soprano. |Die Gotterdammerung Siegfried's Funeral March & Immolation Scene, Margaret Harshaw, soprano (18'34). CD 2--Samuel Barber: Music for a Scene from Shelley (9'00) |Alberto Ginastera: Pampeana 3 (Pastoral Sym.) (19'10) |Henri Dutilleux: Cinq Metaboles (16'05) |William Walton: Violin Concerto with Zino Francescatti (28'27). CD 3--Beethoven: Missa Solemnis (76'38)--Saramae Endich, soprano, Florence Kopleff, contralto, Ernst Haefliger, tenor, Ezio Flagello, bass. CD 4--Schubert: Octet in F Major (62'34)--Robert Marcellus, clarinet, Myron Bloom, horn, George Goslee, bassoon. For this performance, the string section was enlarged to 17 players. |Berlioz: The Damnation of Faust: 3 excerpts (12'48): Minuet Will o the Wisps (5'56), Interlude, Ballet of the Sylphs (2'42), Rakoczy March (4'10). CD 7--Interviews with George Szell. 1) with John Culshaw--rec. in London for the BBC, September 1968, 2) with James Fassett, rec. in NYC for WQXR 12 APR 1963 (9'03). 3) with Paul Myers, rec. in Cleveland for CBS 25 MAR 1966 (8'27). 4) with James Fassett, rec. in NYC for WQXR 12 NOV 1965 (4'28). "Even at home, Mr. Szell's musical integrity would not be silenced. He would sometimes stop and correct his wife's casual whistling, insisting that as long as she was going to whistle, she might as well get the tempo and pitch right. "Mrs. Szell, the former Helene Schulz of Prague, whom he married in 1938 in GLasgow when he was conductor of the Scottish National Orchestra, cultivated forbearance and a dry wit during her years with Mr. Szell. She needled him about his methodical habits and mania for instructing others." I also own another 2 CD set from the Cleveland Orchestra of performances from his last tour with the Cleveland Orchestra, to Tokyo in 1970, put out by the Cleveland Orch. CD 1--Weber: Oberon Overture (9'11) |Mozart: Sym. 40 in G Minor, K. 550 (26'22). CD 2--Sibelius: Symphony 2 in D Major, Op. 43 (42'20) |Berlioz: The Damnation of Faust--Rakoczy March (4'21) |Interview with Pierre Boulez about George Szell and the 1970 Tokyp tour. (19'31). The booklet contains lots of b&w pics, and a long article by Eugene Kilinsky, the Cleveland Orch. librarian (1968-85). Ah! Thank you. Makes sense. A colorful and appropriate expression. Szell appears 121 times in my catalogue. That's too many for me to investigate individually. But several are as pianist. Maybe we should flip a coin - heads or tails - to determine if this is a worthwhile investment for us. (It probably is ... but ...) Then again, you may be getting your copy at no charge for review! Reblem, you got this right! I too believe I will pass on this mega-set as an act of nonviolent resistance. Though I have been delighted to come into possession of numerous box sets thanks to the conglomeratization of our hellbound world, this one seems like a missed opportunity if aimed at the seasoned collector, at least. Though I fear there may be some remasterings that may make me eat my hat by and by, I am currently leaning towards passing based on the price tag on top of the few, but I would say key, items that seem to be missing. I have been a Szellot for years, ever since I first heard his Beethoven symphonies and the piano concerti with Fleisher, and since then I've added a whole darn lot of Szell to my record collection, including the Korean 49-disc Szell Edition, a special seven-disc Cleveland Orchestra Centennial Edition, the Decca and Philips box set (which actually, has some of Szell's most impressive recordings, I would say, albeit with orchestra's other than Cleveland), and two Orfeo box sets with live performances, as well as various others, in particular Szell's collaborations with great soloists like the aforementioned Leon Fleisher, Rudolf Serkin (these, I think, are the best of the lot), Clifford Curzon, David Oistrakh, Robert Casadesus, Isaac Stern, et. al. In an effort to shine some light onto what is missing here, I will cross reference what I have and/or know to exist in terms of the Columbia and Epic issues with JPC's listing of included tracks, and see if we can't figure out along the way some highlights to what has been included, as well. It seems to me that most of the material from the eight-volume United Archives series is included. I am basing this on the fact that certain pieces that are listed with the appended note "zwei [oder drei] Einspielungen," i.e. "two or three versions," correspond to pieces available in stereo on Columbia reissues and in earlier mono takes on the United Archives discs, which drew from Columbia/Epic LP masters. For example, Strauss's Till Eulenspiegel is available in this new box set in two versions. I imagine one is the famous stereo version from 1957, and the other the undeservedly less famous mono version from 1949 (both with the Cleveland Orchestra). The United Archives disc of this mono version is available here: https://www.amazon.com/Weber-Overtures- ... auss+weber, or here: https://www.amazon.com/Weber-Overtures- ... auss+weber. This is, as noted, only my assumption, but perhaps a safe one as there are many such coincidences. If true, then what appears to be missing from the music United Archives discs is a Brahms "Haydn Variations" with Cleveland from 1955, in mono. This piece is not listed in the new box set as coming in multiple versions, thus I assume (whoah, I am doing a lot of assuming here) the version included is the stereo ones with Cleveland, from 1964. The United Archives disc is available here: https://www.amazon.com/Brahms-Symphony- ... variations. The most blatant omission here is the double disc of Cleveland live in Tokyo in 1970, which I believe has already been pointed out. This set has an absolutely riveting account of Sibelius's 2nd Symphony (which piece, by the way, is not included in this new box set in any version because Szell's other recording of it is on Philips, with the Concertgebouw). It also has one of my all time favorite accounts of Mozart's "Big" G Minor Symphony (i.e. #40). The good news for those considering investing in the new box set news is that the double disc of that concert is available separately, here: https://www.amazon.com/Live-Tokyo-1970- ... zell+tokyo. Also missing from the new box set, vs. the Korea set, is Bruckner's 7th in a live version with the Wiener Philharmoniker from the Sazlburger Festspiel, 1968. This same version is also available on the seven-disc set by Orfeo d'Oro boxset "George Szell - Salzburger Orchesterkonzerte 1958-68." What is, however, interesting is that the new box set lists Bruckner's 8th as coming in two recorded versions. I am sure one is the stereo version with Cleveland of 1969. But what could the other be? According to abruckner.com's discography, there is another take of this symphony with Szell and Cleveland from 1969, and it clocks in at almost four minutes quicker (a big deal for a Bruckner interpretation, particularly with the same conductor and orchestra and the same year). I don't know if this was a live take or what? Were cuts made in the studio recording release? It will be interesting to find out (I guess for those who do buy this set, since, as I said, I don't think I will). In any case, the same published version of the score (1890 Nowak) was used in both these takes, but the non-Columbia one is listed as having been issued on the labels Artists, Sirio, and World Music Express (all phoney baloney pirates, I believe). There is also a listing of a 1951 Szell recording of the same symphony with the Concergebouw, but using the 1892 Schalk/Haslinger-Schlesinger-Lienau version of the score. I do not think the other version of the symphony included in this box set could possibly be that one. Also missing in comparison with the Korea set is Mozart's Violin Sonata #7 in F, K 376 (374d), with Rafael Druian (Cleveland's then concertmaster) on violin and Szell at the piano. Strange indeed, since the other three Mozart violin sonatas with Szell on piano are included. This could be an oversight in JPC's cataloging or in Sony's compilation of the set. Sony is the likely suspect, since they have been guilty of such oversight before (such as omitting the Theresienmesse from the Tafelmusik Baroque Orchestra box set of supposedly "Complete Sony Recordings." Compared to the Korea set, in any case, the above was all I could find missing. On the other hand, the new big box set has quite a lot that wasn't included in the Korea set (for reasons I have never been able to discern). In terms of symphonic works, you get Prokofiev's 5th, Mahler's 4th, and Debussy's La Mer, that, as stated, were omitted by Sony Korea in their Szell- The Edition. Aside from that, there is a host of concertante works with the various artists listed at the bottom of the JPC page (John Browning, Robert Casadesus, Rudolf Firkusny, Leon Fleisher, Gary Graffman, Vladimir Horowitz, Rudolf Serkin, Rafael Druian, Zino Francescatti, Isaac Stern, Joseph Szigeti, Abraham Skernick, Pierre Fournier, Leonard Rose, Judith Raskin). I have acquired these all - well, almost all - separately over the years. There do seem to be a few, as well, that aren't available or affordable on CD. One case in point is Tchaikovsky's Rococo Variations with Leonard Rose and the NY Philharmonic from 1955, never transferred from LP before, as far as I know. By the way, Youngrok Lee's Szell discography does not list him as ever having recorded Prokofiev's 4th Piano Concerto. I wonder if this is another oversight, as it is listed as coming in this new box set. It could just be the coupler to Szell's Bartok 1st Piano Concerto with Serkin, which was the Serkin-Ormany recording of the Prokofiev 4th Piano Concerto. We (or you) shall see. 3. SMETANA - 3 DANCES FROM "THE BARTERED BRIDE"
For some odd reason, both sets included the overture but omit three dances from Smetana's"The Bartered Bride." They are available (and worth getting) here: https://www.amazon.es/Dvor%C3%A1k-Symph ... B00EXD57JY. Finally, it is worth noting that the new set includes multiple versions of several pieces that aren't available in one place, or at all, elsewhere. Most notable are Beethoven's 2nd Symphony and Schubert's 8th Symphony, for each of which, as far as I know, there is currently only one CD version available anywhere. I imagine these will be earlier versions, perhaps in mono. Youngrok Lee's Szell discography confirms Szell recorded the Schubert with Cleveland three times, but the Beethoven is listed as only having been recorded once. Intriguing. There are also two versions of Hindemith's Symphonic Metamorphoses on Themes of Carl Maria von Weber, for those who just can't get enough of this piece, as well as of Rossini's Overture to La Gazza ladra and Weber's Overture to Oberon. I hope this has been of help. In any event, I can only urge all of you, if you don't have much Szell, to get a hold of as much as you in any way possible. Surely his tyrannical approach to the podium did not earn him a fond reputation, but as Terry Teachout convincingly argues here (https://www.commentarymagazine.com/articles/hard-szell/), his records are the greatest testament to the incredible power of concerted expression of which an orchestra is capable in the unfettered hands of a genius with equal parts talent, discipline, passion, architectural understand, and just one of the most incredible ears there ever must have been. Happy listening, and I look forward to any comments on anything I may have missed! Thanks for all the detailed info on what's there and missing. I also heard a broadcast of Szell guest conducting the Chicagoans in Beethoven's 5th and 6th. Stunning, beautiful, unforgettable. Way better than the Epic studio recordings. I agree that Szell was more flexible in concert than on records, especially with orchestras not his own: NYP, VPO, RCO. He also conducted in concert some cool modern stuff (Easley Blackwood, Howard Whittaker, Boris Blacher, George Rochberg and Benjamin Lees) and some standard repertoire like the Tchaikovsky 6th not usually associated with him. I heard him say in an interview he considered Tchaikovsky to be a great orchestrator. Also that his calling card in Europe opera houses between the wars was CARMEN! Who knew? WCLV documented most everything he did in Cleveland from 1965 to his death in 1970 and I have a lot of those broadcasts. I'm intrigued whether there is an earlier, unreleased recording of the 8th. Van Beinum's 1955 recording was also issued on Epic and is also an outstanding performance, my favorite after Szell's. The other 1969 listings on abruckner.com are the concert performances. As mentioned, they are faster than the commercial recording. So is another 1969 live concert with the Vienna Philharmonic on Living Stage. The commercial recording was recorded over 4 sessions spread over a two-week period in October. Sony Japan has recently issued a hybrid SACD of this recording from the four track master tape. It sounds magnificent with beautiful string sound and weighty brasses. The engineers also didn't try to get rid of tape hiss--it is noticeable but I didn't find it obtrusive. I don't know if this is a four-channel SACD since I only have two-channel playback. The extensive notes are 99% in Japanese. It is coupled with the 1966 Cleveland recording of the 3rd, taken from the original three track master. The CD layer looks to be the same mastering that were issued a few years ago. As this is a desert island recording for me, I ordered it from cdJapan for about $53 including shipping. I know several members rank this performance very high, and if they weren't aware of this issue they might be interested in obtaining it.